It’s difficult to miss the sight of Royal Albatross berthing in her glory at the private pontoon at Resorts World Sentosa’s waterfront. After all, the Tall Ship was designed to stand out. 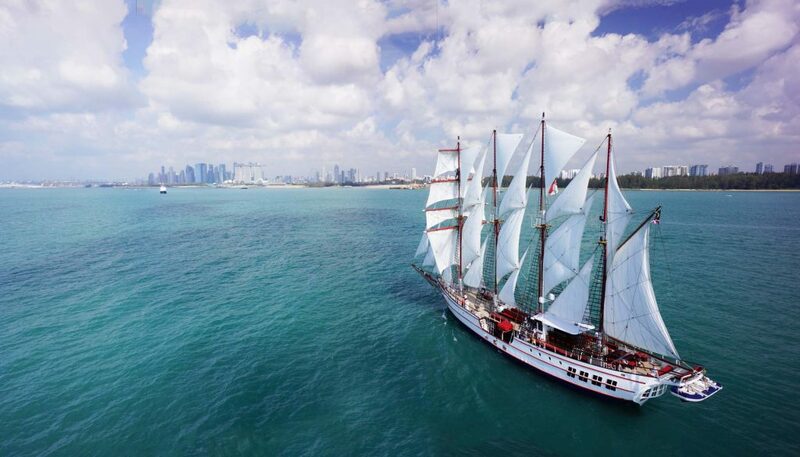 Originally purposed for day trips and races in the US, the ship made her way to our shores in 2008, and after extensive reconstruction, began her new life in Singapore. The four-masted, 22-sail ship — each sail represents one of the 22 species in the Albatross family — started out as a private charter in 2015. Today, it has expanded its wings, offering a variety of activities to those who wish to set sail for an evening around Singapore. The Sunset Sail, one of the Royal Albatross’ signature offerings, sees guests hopping on board for an international set dinner and welcome drink. While the ship sails out to sea from Sentosa, guests can continue to enjoy cocktails and live entertainment well into the night. Fridays are reserved for social events, where groups of friends gather for a night of mingling under the stars. Sundays are best kept for families. The Sunday Roast begins dockside at 11am, and serves mouthwatering traditional British fare. These weekend packages will be available from 30 June onwards. Corporate, private and wedding charters are also available. For more, contact Royal Albatross at reservations@tallship.com.sg or +65 6863 9585.